Algoa Brick is committed in reducing the total energy consumption of the business. This to be able to improve and sell Energy Efficient Clay Brick(EECB) into the market. The company has embarked on various energy saving methods. Slowly but surely we are replacing all electrical motors in the two plants with "Energy Efficient Electric motors". The company has also already replaced all lighting inside and outside with "Energy Efficient Light Bulbs" Obtaining these 4 new Linde 2,5 Diesel forklifts was in line with the company's strategy to only purchase energy efficient equipment. The company currently runs a fleet of 13 Linde forklifts and the 4 new trucks is to replace the older units in the fleet, keeping its fleet modern and reliable. 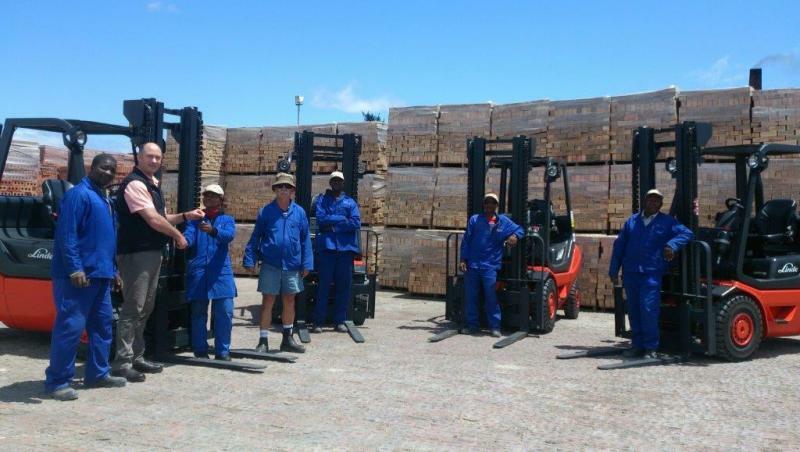 Loading trucks speedily and on-time is essential in our commitment to customer service and on-time delivery. The new vehicles will be a significant factor in reducing Algoa brick product's Carbon Footprint. These vehicles use High-economy engine technology, which includes low fuel consumption, low exhaust gas and soot emission levels, fit with EU stage and a standard diesel engine. The above played a pivotal role in deciding on these Linde's. Caption: (L to R) Aubrey Funani-Team Leader, Nico Mienie-Managing Director handing keys to Doreen Ngqinambi-Forklift Driver, Johan Muller-Yard Supervisor, Llewellyn Maqanda- Forklift Driver, Tamsanqa Tyityi- Forklift Driver, Kholekile Wakeni- Forklift Driver.